Everything you need to get you started on your exploration. Cut Off Wire – remove slabs of clay from the block. Synthetic Sponge – smooth clay, surfaces and remove water from work. 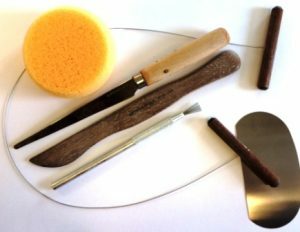 Fettling Knife – cut out clay from templates, cut extrusions cleanly. Wood Modeling Tool – cut out parts, smooth joined pieces seamlessly. Feather Texture Brush – make quick work of scoring components for assembly; add texture to surfaces.